When it comes to Hollywood making movies based on historical events, there is a fine line between fact and fiction. Hyperbole is the nature of mass entertainment. 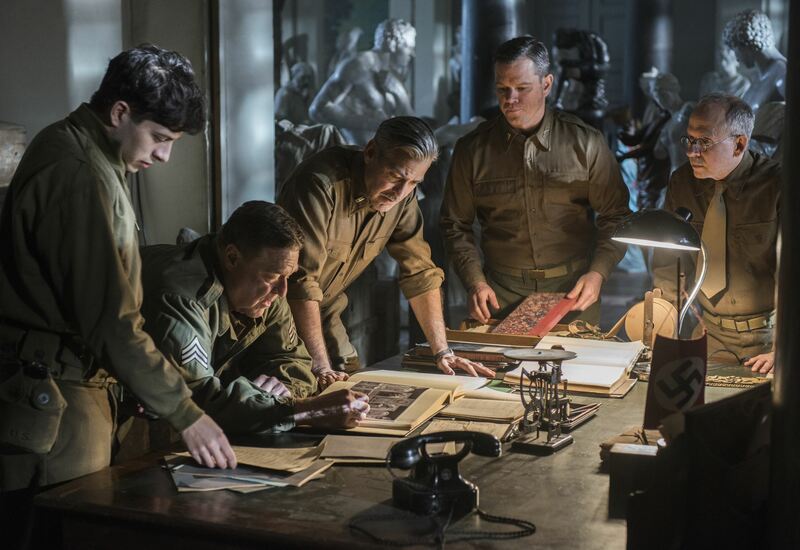 There is no drama lacking in the George Clooney-directed film, The Monuments Men, featuring a star-studded cast that includes Cate Blanchett, Matt Damon, Bill Murray, John Goodman and Clooney himself. The movie follows true-to-life heroes who band together as soldiers to recover Nazi-looted artwork. The endeavor was called “The Greatest Treasure Hunt in History,” according to the subtitle of the non-fiction book from which the movie was adopted. However to supporters of the non-profit Monuments Men Foundation (MMF), the events that unfolded during WWII were also considered “The Greatest Art Theft in History.” And for once, history trumps Hollywood. Unlike the movie version, there were more than a handful of enlistees consigned to protect historic buildings, which was the original mission. According to the MMF, as many as 350 soldiers were involved. After the mission expanded to include recovery efforts, the men eventually recovered 5 million pieces of artwork, books and documents. Despite locks, alarms, and laws, it is inevitable that art will be stolen. So how can adjusters advise their insureds to protect their items of value? Determine provenance. Ascertain the history of the artwork; document the previous owners and preserve all bills of sale. The longer the list of legitimate transactions, the better. Fully document the artwork by including complete details like the following: The artist, the type of object, the title of object, materials and techniques used, its measurements, date or period when created, any inscriptions and markings, any distinguishing features, and the subject of the piece. Take quality photographs and store the piece in a safe place, preferably a location away from where it resides. What to do after the artwork is stolen? Alert the major art loss databases such as the Art Loss Register, Interpol, and the National Stolen Art File. These organizations act as a clearing house for stolen art and are set up to help with recovery efforts. Reputable auction houses will typically run a search across these international databases before putting a piece up on the block. It’s a relief to know that this networked system of recovery works as intended. Coincidentally, Artdaily.org reported on February 7, the debut of The Monuments Men, that U.S. authorities had recovered a work by the 18th century German painter Johann Conrad Seekatz. It was determined that the work had been stolen from a Warsaw, Poland, museum by the Nazi army sometime during the 1939-1945 conflict. Today the Monuments Men Foundation continues on its mission to preserve art. To learn more and to let Congress know of your support for the arts, visit http://www.monumentsmenfoundation.org/. This entry was posted in Contents Claims and tagged Bill Murray, Cate Blanchett, George Clooney, John Goodman, Matt Damon, Monuments Men Foundation, The Greatest Art Theft in History, The Monuments Men. Bookmark the permalink.